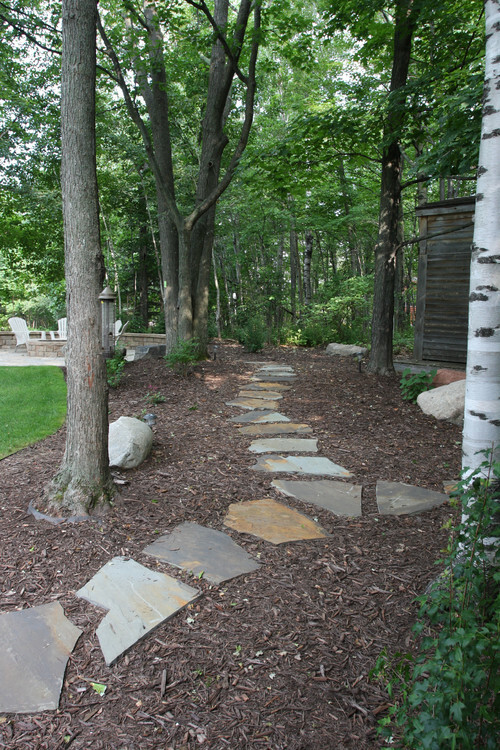 Bark mulch is one of those landscaping materials that we’ve all heard of but don’t necessarily know how to use. Here are 5 ideas to inspire you. Bulk mulch is one of the cheapest and easiest ways I know to protect new planting and keep it looking good. In this picture we can see some young herbacious perennials carefully spaced in a new planting scheme. These plants will eventually fill out and cover most of the soil. But until they do, a layer of bark mulch helps keep the soil damp. It also supresses weeds so that whoever is caring for this garden has a lot less work to do. 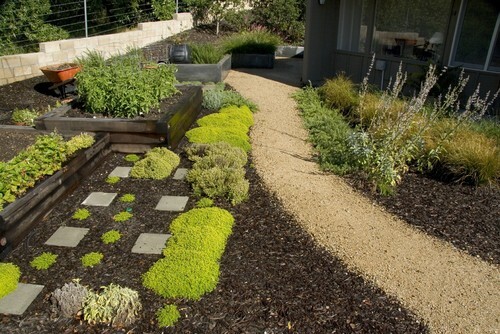 I “borrowed” this picture from Houzz simply because I love the concept. Here we have a path leading between trees. In summer time its beautifully shady – so much so that few plants will want to grow there. So the clever landscape designer has used a combination of paving stones and bark mulch to make the sort of path you can’t resist exploring. I don’t know about you, but I want to follow this path and see where it goes. 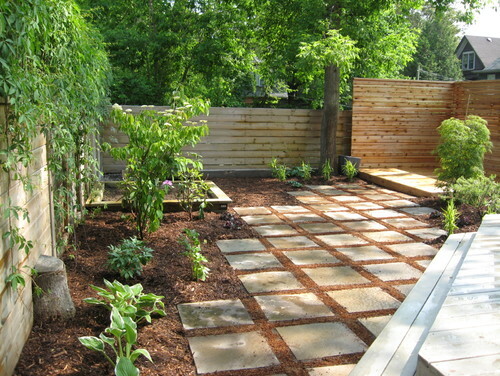 This combination of paving slabs and bark mulch really appeals to me. Probably because there are no sharp divisions between patio and planting. It all merges into one. I like the symmetry buy I also like the softness. I’ve adapted this idea for my own garden – but right now it’s not looking smart enough to take pictures for you. I love the adaptability of my garden. I’ve cared for it for 30+ years and in that time it has changed again and again. First there were no children and no dogs, then there were babies, then toddlers and dogs, then teenagers, no children then grandchildren – you get my drift. So when I make changes, I don’t expect them to be permanent and I don’t want them to be expensive. At the moment I’m growing veg in a polytunnel surrounded by raised beds. The whole area is mulched. It’s easy to walk on in all weathers, I can wheel my wheelbarrow across it, the grandchildren love loading it into their toy tractors. And when I’m too old to grow veg, it won’t cost a fortune to change the way I use that area. This is where bark mulch really comes into it’s own. Play grade bark is clean, it’s bouncy and if you fall on it you won’t get badly hurt. Ideal then for use underneath swings, slides, treehouses etc. Bark Mulch is bulky. So if you’re doing a project of any size, it’s well worth having it delivered to your house in those big builders bags. Turfonline offer two different grades of bagged bark mulch that can be delivered to your door – as quickly as the next working day.